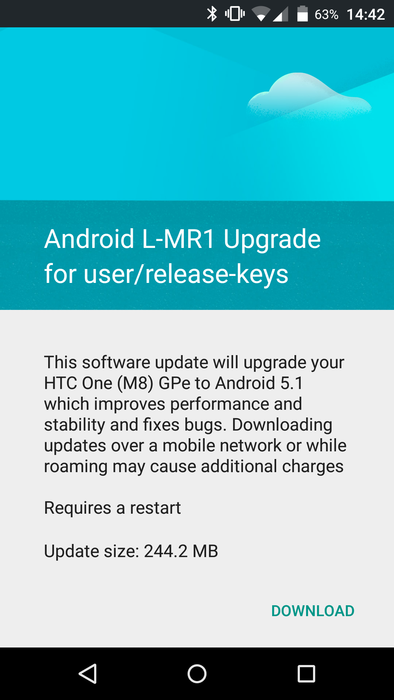 The update from Android 5.0 is 244MB, which is pretty typical. Remember that any modifications to the recovery or system partition will cause the update to fail thanks to the new checks implemented in Lollipop. Those of you who want to manually flash the update file can find it here, and this collection of RUU files will allow you to flash your phone back to stock 5.1 in both pristine and rooted condition. Thanks to the Android subreddit for the links. But what about the previous version, the HTC One M7 Google Play Edition? Never fear: the ever-reliable HTC rep Mo Versi says that the older flagship will be getting its own update soon. The M7 5.1 build was approved at about the same time, so it should be zooming over the airwaves sooner rather than later. Approval for both M8 & M7 GPE versions have been granted by Google for 5.1 OS. OTA out shortly!